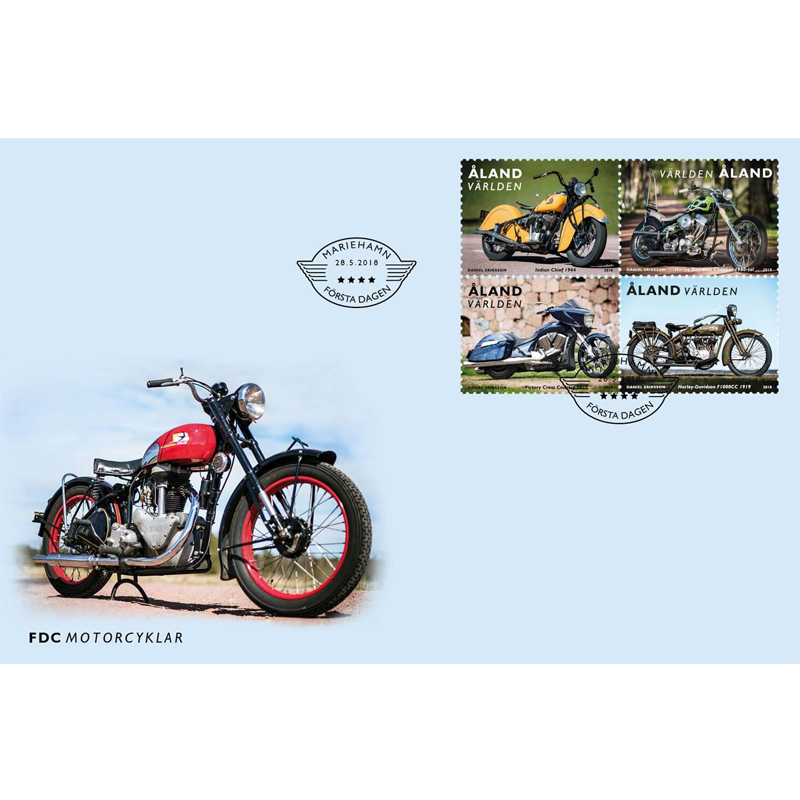 On 28 May, the 2018 stamp booklet from Åland Post presents to you a cavalcade of the history of motorcycles, documented by Åland photographer Daniel Eriksson. 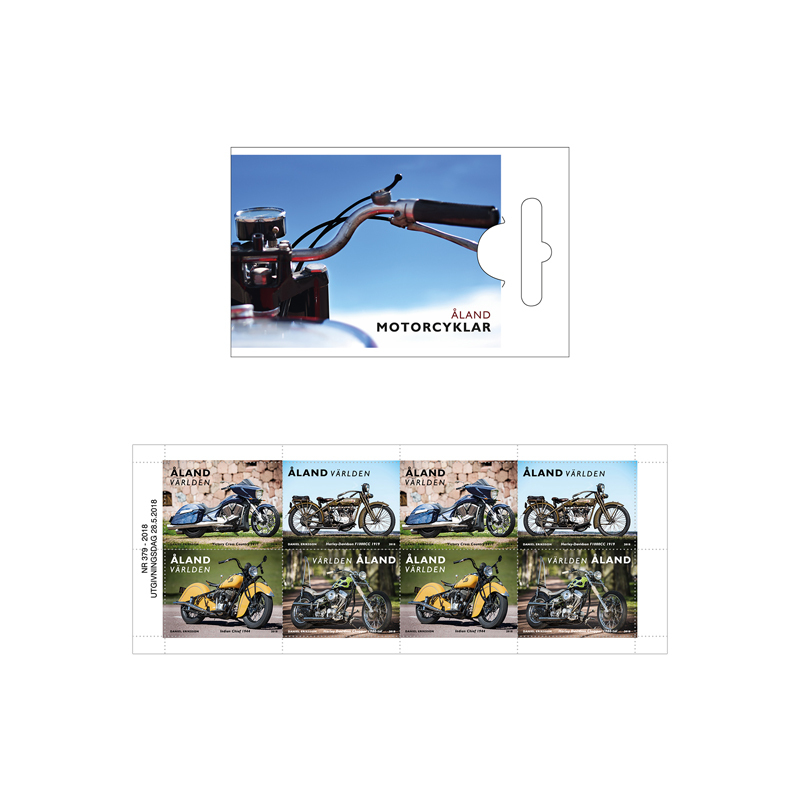 An ultimate sense of freedom, that’s the magic of bikes, says Martin Cromwell-Morgan, owner of the Indian Chief adorning a stamp. Martin came across his Indian Chief in Galong, Australia, when he was travelling around the world in 1991-92. First sold to the Australian Army in 1944, it was utilized as a police motorcycle after the war. Martin goes on motorcycle tours in Europe every year. 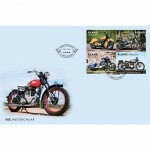 The oldest motorcycle portrayed is a 1919 Harley-Davidson 1000cc. Knut Kronström purchased it in Sweden in 2008. Stored in a basement in dismantled condition since the early 1970s, Knut has now restored the mechanical parts, aiming at preserving its original overall appearance. He won second prize in the Classics class at the Norrtälje 2016 Custom Bike Show. 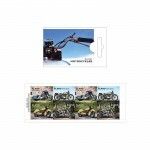 The third stamp features a HD Chopper bought in Sweden by Micko Koskinen from Mariehamn in 1989. This classic chopper is a hotchpotch of parts from various vintages. A modern 2011 Victory Cross Country finishes our time travel. Krister Ljungdahl, who runs a motor repair shop in Mariehamn, covers hundreds of kilometres with his bike across Europe every year. On the booklet cover we find a Swedish Svalan MC 75. Purchased by postman Algot Mattsson in 1957, he used it in the winter for carrying the mail across the ice of the northern Vårdö archipelago. Algot’s grandson Christer has, as far as possible, restored it to its original appearance. New are only the exhaust pipes and saddle.